In a Vase on Monday: I Wish…. I know it’s Monday. I know I ought to be offering a vase. Cathy at Rambling in the Garden has created this wonderful meme that invites us to share what is growing in our gardens in a vase to brighten our homes. And I know Cathy will be disappointed in me, but…. Alas (sigh) we have experienced sleet, snow and quite low temperatures for this area. I had hoped to display a few of the winter pansies today. This photograph will explain why I must plead absence this Monday. At least we didn’t get the 8-10 inches of snow that was forecast, and the forecast is for warming later this week. I did get most of my winter cleanup accomplished before the storm. Perhaps I’ll even be able to get in my tennis match on Thursday. Please visit Cathy’s blog at Rambling in the Garden to see what she and so many others have brought in from their gardens this week. 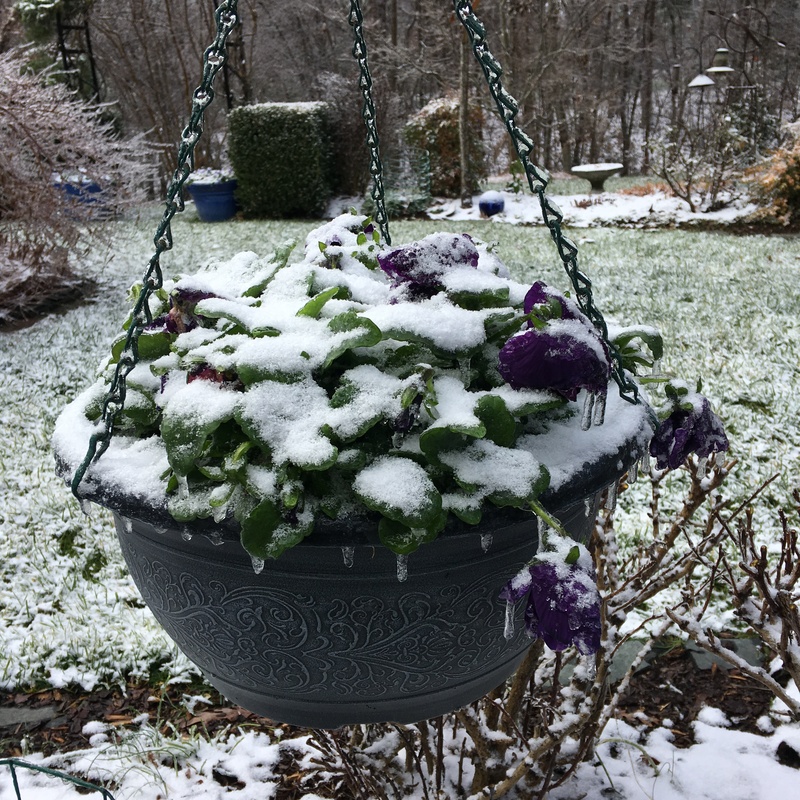 This entry was posted in Gardening, In a Vase on Monday and tagged Rambling in the Garden, winter pansies, winter storm. Bookmark the permalink. 13 Responses to In a Vase on Monday: I Wish…. It happens to us all John. You’ll soon have some flowers again. I know, but it’s not much fun waiting. Best to stay in, plan and read seed catalogues! I was thinking wine and cheese, but you ideas are probably better. Thanks, Cathy, for your understanding. I’ve actually finished the winter garden tasks, so maybe I can have a bit of wine to soften the winter. I can feel for you this week John – we have a little more snow than you, with more forecast, and I didn’t even venture out today! Hope it clears up for your tennis match! I won’t report on my match. Am just glad for a positive forecast for some warmer weather. My gardens still are underneath 10-12 inches. More than I can remember falling — and staying in a very long time! I love this photograph with the tiny frozen droplets hanging from the leaves and flowers like miniature icicles. Thank you. Time passes, it gets warmer, and now I have those flowers again.